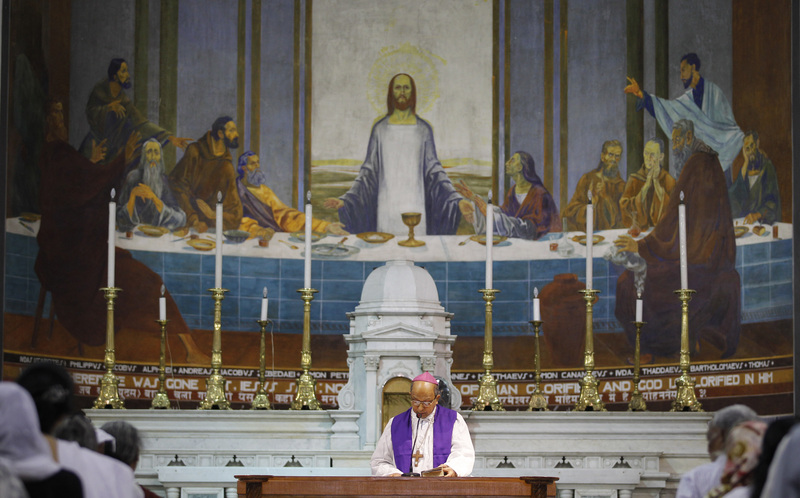 Archbishop of Delhi state Anil Couto reads from a holy book during a service on Good Friday at the Sacred Heart Cathedral in New Delhi, India in 2013. India's governing Hindu nationalists on Wednesday criticized the archbishop of New Delhi for saying that a turbulent political atmosphere is posing a threat to the country's democratic principles. The president of the ruling Bharatiya Janata Party, Amit Shah, accused the archbishop of trying to divide people on the basis of religion. "I personally believe that no one should say things like this, for a religious person to make such comments cannot be accepted and appreciated," Shah said. A top party lawmaker, Subramanian Swamy, demanded the scrapping of diplomatic ties with the Vatican because of the archbishop's remarks. K.J. Alphons, India's tourism minister and a BJP leader, said the archbishop's comments were unfair and that "godmen" should stay away from politics. Archbishop Anil Couto, in a May 8 letter sent to New Delhi's Catholic churches, urged members to pray for democracy and for marginalized people ahead of national elections next year. He included a prayer to be read during Masses that asked "May the ethos of true democracy envelope our elections with dignity." The prayer also called for marginalized people to be "brought into the mainstream of nation-building." Minorities have complained of rising attacks by Hindu hardliners against them since Prime Minister Narendra Modi came to power in 2014. Christians make up just 2 percent of India's population, which is overwhelmingly Hindu but has a sizable Muslim minority. Church leaders normally avoid getting too deeply involved in politics. The archbishop's letter angered Hindu nationalists as it came at a time when Modi and his party are preparing for next year's national polls. The archbishop was, however, supported by opposition politicians. Mamta Banerjee, the top elected official in West Bengal state and a member of the All India Trinamool Congress party, said, "I think whatever he has said was correct. It is a fact." Sitaram Yechury, general secretary of the Communist Party of India (Marxist), defended the archbishop, saying the only protection for minorities is the constitution's promise of equality.